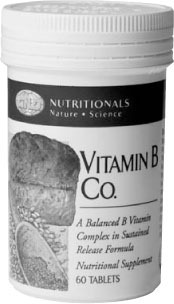 In nature, the vitamin B-complex occurs in balanced ratios. This does not mean equal quantities of each vitamin. Some of these B-vitamins are always present in relatively large amounts, while others never exceed minute quantities. But, this “balance” helps maintain the highly interrelated functions of the entire complex within our bodies. In fact, this balance is so important that an excess of one B-vitamin may cause excessive elimination of the others. GNLD wanted to produce a complete B-complex supplement containing all 11 factors in specially balanced ratios. When our bodies receive more B-vitamins than can be utilized, the excess is rapidly and wastefully excreted. This result is lost nutrients and lost money spent on supplement products. To resolve this problem, GNLD developed its Sustained Release Technology, an exclusive GNLD process which allows for a slow, monitored release of nutrients into the system. This dependable, regulated delivery provides a continuous supply of nutrients around the clock. Waste is minimized and the B-vitamins are more efficiently utilized. GNLD B-Complex product is of exceptional quality. Many other products in the marketplace do not include all the B-Complex factors. Nutrients often missing include choline, inositol, P.A.B.A. and pantothenic acids. Enjoy the GNLD difference in quality. Take 1 tablet daily as a dietary supplement.